When guitarist Roy Clark died recently, he was remembered mostly for his many years on Hee Haw. But he started out as a Wanda Jackson's ace guitarist. So he built his reputation with his guitar. And when given the opportunity, Clark was very versatile. He could play any kind of music with anyone. That's why he liked to play concerts with symphony orchestras. One of my favorites is the 1979 album Makin' Music by Roy Clark and blues legend Clarence "Gatemouth" Brown. Sadly these opportunities didn't come around very often because even music business veterans had preconceptions about Clark because of Hee Haw. 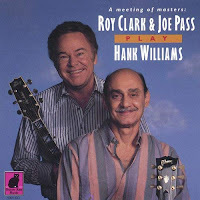 So when LaserLight Digital producer Ralph Jungheim approached Clark about recording with jazz guitar legend Joe Pass, Clark was delighted. He was a big Joe Pass fan. Jungheim had recently produced a Joe Pass Christmas album Six String Santa. And he also produced Ruth Brown, Etta James, Boots Randolph and even Jack Lemmon. They decided to record an album of Hank Williams classics with Pass' usual band of John Pisano on rhythm guitar, Jim Hughart on bass and Colin Bailey on drums. The album was released on Ranwood Records owned by former Dot Records head Randy Wood and it's available as a digital download. Sadly this was Pass' final recording as he died of liver cancer on May 23, 1994 at age 65. But this seemingly unlikely pairing turned out very well. 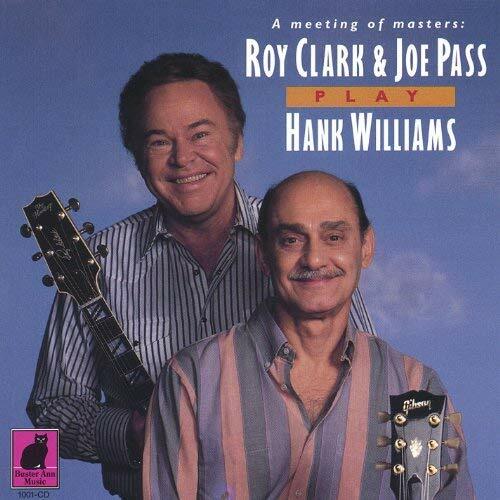 Here's Roy Clark & Joe Pass performing Jambalaya Jan. 1994. What talent from both of those two. Roy Clark had such talent. He will be missed by older people like me who do remember him from Hee Haw and his other musical performances.